Hooper, D. (2018). Testing the waters: Gauging the viability of self-directed language learning in an eikaiwa school. Relay Journal, 1(2), 330-338. *This page reflects the original version of this document. Please see PDF for most recent and updated version. This perspective piece discusses the need for and viability of educators promoting self-directed language learning among adult students in the under-researched private English conversation school (eikaiwa) context. In this article I will present some potential contextual constraints to be negotiated as well as highlighting possible fruitful approaches for the fostering of self-directed learning with eikaiwa students. By examining existing research on both eikaiwa and self-regulation as well as the factors that draw students to these schools, this article describes how teachers can harness prevalent beliefs in eikaiwa and direct them into attractive and empowering self-study resources for their learners. SDL was initially associated with adult education programs, with a number of European and North American educational institutions incorporating SDL principles in their open-learning programs (Hiemstra, 1994). Later, due to the clear potential of SDL in the field of language education, the concept of self-directed language learning (SDLL) soon emerged, referring to a situation where responsibility for decision making related to language learning is placed in the hands of the learner. This can be “with or without a variable degree of participation” by an agent (e.g. a teacher) who acts as a “helper in response to requests for information or advice” Holec, 1996, pp. 89-90). It has been reported in a number of studies that SDLL can offer multiple benefits to language learners such as increased linguistic knowledge, developed meta-cognitive skills, increased motivation and confidence, as well as a heightened sense of responsibility and independence (Du, 2013; Victori & Lockhart, 1995; Wenden, 1991). Self-directed learning is best viewed as existing on a continuum featuring varying degrees of learner autonomy depending on each individual learning situation. Brockett and Hiemstra (1985) argue that self-directedness should be seen as “a characteristic that exists, to a greater or lesser degree, in all persons and in all learning situations” (p.11). Both teacher and institution can indeed play important roles in self-directed learning such as encouraging dialogue with learners about their self-study, securing learning resources, negotiating learner goals and views, and offering individualized study options (Hiemstra, 1994). Within Japan, an area of ELT that is largely neglected in studies relating to SDLL and indeed within academic inquiry in general, is the private English conversation school (eikaiwa) sector. In terms of the position of conversation schools within Japanese ELT at large, Seargeant (2009) claims that the eikaiwa industry is the “most visible context in which the actualities of language learning within Japanese society clash with current trends and recommendations in contemporary TESOL theory”(p.94). Furthermore, eikaiwa represents a multi-billion yen industry (Hawley-Nagatomo, 2013; Seargeant, 2009) with schools in every major city in Japan (METI, 2005) that draw students from a wide range of social groups and generations. However, despite the substantial economic and cultural impact of these schools on Japanese ELT and society, to date there remains a relative paucity of research into eikaiwa when compared with other educational settings (Lowe, 2015; Makino, 2016a; Hawley-Nagatomo, 2013). In the area of self-directed language learning in particular, eikaiwa represents a unique and challenging pedagogical context. Kubota (2011) challenges the notion of enrolment in eikaiwa schools being necessarily based on investment (Norton, 2000) where learners demand some kind of tangible return on the time and effort they put into learning such as enhanced cultural capital or socioeconomic status. In her investigation of a number of franchised and community-based eikaiwa classes, Kubota postulated that these environments shared more in common with “casual” or “serious” leisure activities (Stebbins, 2007) than the traditionally-held conception of the language classroom as a site of education and intellectual development. This perspective on eikaiwa has been supported by a number of Japan-based studies that characterize this sector of ELT as a casual, often transient, and hobby-like setting (Hawley-Nagatomo, 2013; Makino, 2015; Sugiyama, 2010). A further issue that arguably sets eikaiwa apart from almost every other pedagogical setting in Japan is the respective identity and positionality of teacher and student. While compulsory English education in Japan is arguably still based on traditional, teacher-ruled classrooms, due to the overt commercial nature of most conversation schools, the balance of power in the classroom is firmly weighed in favor of the students or ‘clients’. In an institutional setting perhaps more akin to a service industry, student evaluations of teachers’ teaching methods, behavior, or even physical appearance can have serious consequences in terms of their perceived competence in the eyes of the company and even their job security (Bueno & Caesar, 2003; Currie-Robson, 2015). This means that any misplaced effort by an instructor to urge students to engage in out-of-class study could result in unfavorable feedback from their ‘clients’ and damage their standing within the school. Furthermore, the majority of major chain eikaiwa schools do not set homework and have been described by some as having an attitude of “come an hour a week and talk or play games, then buy a textbook on your way out” (Makino, 2016b). Sapunaru-Tamas and Tamas (2012) examined various eikaiwa promotional materials and argued that language used in eikaiwa advertising promoted the notion that the burden for language learning lies primarily on the instructor and that the industry disseminated a marketing strategy similar in nature to that of fad protein shake diets. This claim is perhaps given more credibility by the recent foray into the eikaiwa industry by fitness chain Rizap claiming that they are “committed to showing results in two months” (最短２ヶ月で結果にコミットする) (retrieved from https://www.rizap-english.jp/about/ on January, 2017). Studies into the promotion of self-directed study in eikaiwa are extremely sparse. Brown (2005) focused on learner training and learning strategies within a study that took place in one branch of the nationwide eikaiwa chain, NOVA. He found that although the internal textbook syllabus contained “Review Tips” that provided ideas for self-directed home study, this section of the lesson was often neglected by instructors and students. Graded readers and bilingual reading materials were also introduced by the researcher to some students for out-of-class study and were found to be “fruitful, if only amongst relatively few students” (Brown, 2005, p.33). Makino (2016b) reflected on an attempt within a small eikaiwa school to introduce an online/blended self-study component to its adult courses. The instructor had set up websites that included printable worksheets, videos, and a customizable dictionary/flashcard program based on vocabulary that was introduced during classes. However, despite a small number of students initially attempting to use the self-access materials, it was found that few learners used the materials for any extended period of time. The instructor determined that this was perhaps due to a lack of tech know-how on the part of the students and partially due to the notion that “if students think they’re at an eikaiwa, it’s very hard to convince them that they’re actually in a real class run by people who take education seriously” (Makino, 2016b). Several studies claim that ‘fun’ plays a major role in the general perception of what language learning in eikaiwa should look like (Kubota, 2011; Makino, 2016a). This perception is reinforced by the dichotomous discourses said to exist in Japan of ‘eigo‘ (heavily grammar-focused instruction, often for test preparation) and ‘eikaiwa‘ (communicatively-oriented conversation practice) (Hawley-Nagatomo, 2016; Hiramoto, 2013; McVeigh, 2004). Japanese people who enter eikaiwa schools are often attracted by the idea of temporary belonging in “an imagined community of English speakers, which the learners enjoy visiting once every week” (Kubota, 2011, p.485) rather than an extension of the grammar-heavy eigo lessons that they had experienced in their formal education (Hiramoto, 2013). If one also considers the significant power that eikaiwa students (or customers) potentially wield over teachers in a service-industry setting (Bueno & Caesar, 2003), a truly enjoyable approach to self-directed language learning that learners will buy into without formal requirements is clearly necessary for any realistic chance of success. The interaction between interest and the degree to which language learners persist in independent study has recently attracted more attention in the field. Regulation of motivation is viewed as being essential in sustaining independent language learning among learners in distance programs or those who are simply studying outside of the classroom (Mynard & McLoughlin, forthcoming). Although goal setting and monitoring has typically been the focus of studies into motivation regulation, research by McLoughlin and Mynard (2015) highlights the role of interest, along with goal-orientation in sustaining motivation for independent language learning. The researchers refer to the Self-Regulation of Motivation (SRM) model (Sansone & Thoman, 2005) that is based on both goals-defined motivation and experience-defined motivation. Experience-defined motivation stems from enjoying and experiencing interest in the learning process and overlaps, to a certain degree, with the established idea of intrinsic motivation. In their longitudinal study of Japanese university students, McLoughlin and Mynard (2015) found that interest or fun, as well as goals, were important in sustaining the independent language learning motivation. These findings were congruent with the SRM model and showed several instances where learners shifted their focus from goal-focused to interest-focused activities in order to boost their motivation whenever it dipped. This research, along with the SRM model, adds weight to the argument for providing self-study materials for eikaiwa learners that are enjoyable and that can cater to their individual interests. An informal survey of approximately 80 adult learners I conducted in a mid-sized eikaiwa school in Gunma Prefecture indicated that the majority of students exhibited interest in a range of different self-study approaches. The results of the survey showed, however, that most students displayed more favorable attitudes (interested or very interested) towards receptive activities (watching TV/movies and listening to the radio – 79.2%, reading easy books – 71.4%, reading easy news articles – 59.7%, and smart phone word card apps – 57.9%) than toward productive activities (writing a diary – 40.3% and recording speaking on a smartphone – 35.1%). The most popular study approach overall was found to be using TV, movies, and radio for learning with 85.5% of students responding positively (slightly interested to very interested). Fortunately, due to a wealth of online audio and video resources now available, there are a number of attractive options available to teachers wishing to engage learners in out-of-class study. For example, Apps4EFL (www.apps4efl.com) is a free website featuring a wide range of audio and video study resources as well as gamified vocabulary and grammar study tools. Users have access to over 2400 TED talks, plus a selection of video quizzes based on reports from the BBC and Voice of America. The site also features a function called ‘Lyric Learner’ that contains a number of short listening quizzes based on popular music videos that learners can access whenever they have a small window of free time. YouTube is another valuable and familiar resource for learners that can be exploited in a variety of ways for SDLL. The BBC, Voice of America, and The British Council regularly upload instructional videos on a variety of topics for both child and adult learners and there are also a number of independent channels like JenniferESL, Learn British English, and Real English that offer large amounts of regularly updated and varied content. One YouTube channel that may appeal to eikaiwa learners in particular is Bilingirl Chika (www.youtube.com/user/cyoshida1231). This site features over 550 bilingual English/Japanese videos that introduce functional English phrases in authentic scenarios such as overseas restaurants and shops, explain colloquial or slang phrases, analyze common Japanese L1 transfer errors, and explain difficult grammar points for Japanese learners. However, it could be argued that the most powerful element of Bilingirl Chika is the presenter herself, a fluent Japanese speaker of English, and the exotic world of English-speaking friends, overseas restaurants, and Hollywood star interviews that permeates her channel. It acts as a realization of the ‘akogare‘ or longing (Kubota, 2011) towards an exotic imagined community that has been theorized to drive much of the eikaiwa industry (Hawley Nagatomo, 2016; Kubota, 2011; Sugiyama, 2010). If teachers are able to tap into students’ psychological desire for belonging to this imagined community for the purpose of stimulating SDLL, it could be the catalyst for greater learning beyond the classroom. This brief article aims to offer some insight into the obstacles facing eikaiwa teachers who are seeking to promote self-directed learning and some tools that may assist them in negotiating these challenges. Furthermore, it is hoped that continuing the conversation on eikaiwa-based pedagogy can contribute to furthering the professional development of teachers in this sometimes overlooked setting. More research on language learning in eikaiwa is abslutely necessary in arguably every area of TESOL-related enquiry, but perhaps especially so on the topic of learner development. Due to the openly profit-oriented nature of many eikaiwa schools and the misleading claims proliferated through advertising campaigns, I argue that we as educators in Japan have a duty to encourage more grass-roots practitioner research in eikaiwa classrooms. In this way, I hope that both teachers and learners can become more stimulated, self-sufficient, and have greater awareness of what tools they need to reach their respective goals. Daniel Hooper (hooper-d@kanda.kuis.ac.jp) is a lecturer in the English Language Institute at Kanda University of International Studies where he also received his MA TESOL. His MA thesis focused on eikaiwa students’ autonomous vocabulary learning. His research interests include forwarding the academic discussion of eikaiwa and improving its pedagogy. Brockett, R.G. & Hiemstra, R. (1985). ‘Bridging the theory-practice gap in self-directed learning’. In S. Brookfield (ed.) Self-directed Learning: from Theory to Practice. San Francisco, CA: Jossey-Bass, 31–40. Currie-Robson, C. (2015). English to Go: Inside Japan’s teaching sweatshops [Kindle Edition]. Retrieved from amazon.co.jp. Du, F. (2013) Student perspectives of self-directed language learning: Implications for teaching and research. International Journal for the Scholarship of Teaching and Learning, 7(2), 1-16. Hiemstra, R. (1994). Self-directed learning. In B. Rothwell & K. J. Sensenig (Eds. ), The sourcebook for self-directed learning. Amherst, MA: HRD Press. Hiramoto, M. (2013). English vs. English conversation: Language teaching in modern Japan. In Lionel Wee, Robbie B. H. Goh & Lisa Lim (eds. ), The politics of English: South Asia, Southeast Asia and the Asia Pacific, 228–248. Amsterdam, The Netherlands: John Benjamins. Holec, H. (1996). Self-directed learning: an alternative form of training. In Holec, H., Little, D., Richterich, R. (Eds.). Strategies in Language Learning and Use. Council of Europe, Strasbourg, France, 75–127. Knowles, M. S. (1975). Self-directed learning: A guide for learners and teachers. New York: Association. Kubota, R. (2011). Learning a foreign language as leisure and consumption: enjoyment, desire, and the business of eikaiwa. International Journal of Bilingual Education and Bilingualism, 14(4), 473–488. Lowe, R. J. (2015). Cram Schools in Japan: The Need for Research. The Language Teacher, 39(1), 26–31. Lummis, D. (1976). English conversation as ideology. In Y. Kurokawa, (ed. ), Essays on Language. Tokyo, JP: Kirihara Shoten. Makino, M. (2015). Principled eikaiwa. School Owners SIG Newsletter, Issue 2, 3–8. McLoughlin, D., & Mynard, J. (2015). How do independent language learners keep going? The role of interest in sustaining motivation. rEFLections: Special issue: Innovation in ELT, 19, 38-57. McVeigh, B. (2004) Foreign language instruction in Japanese higher education: The humanistic vision or nationalistic utilitarianism? Arts and Humanities in Higher Education 3 (2), 211-227. Mynard, J., & McLoughlin. D. (forthcoming). “Sometimes I just want to know more. I’m always trying.”: The role of interest in sustaining motivation for self-directed learning. In W. Meng Chan, I. Walker, D. Chan and M. Nagami (Eds.) Learning in and beyond the classroom: Ubiquity in foreign language education. Nagatomo, D. H. (2013). The advantages and disadvantages faced by housewife English teachers in the cottage industry eikaiwa business. The Language Teacher, 37(1), 3–7. Nagatomo, D. H. (2016). Identity, gender and teaching English in Japan. Bristol, UK: Multilingual Matters. Norton, B. (2000). Identity and language learning: Gender, ethnicity and educational change. London: Longman/Pearson Education. Sapunaru-Tamas, C., & Tamas, A. (2012). The Eikaiwa Phenomenon in Japan or the Three-Day Magic Formula: between Marketing and Language Acquisition. Osaka Denkitsuushin Daigaku Ningenkagaku Kenkyuu (14), 95–106. Seargeant, P. (2009). The idea of English in Japan: Ideology and the evolution of a global language. Bristol, UK: Multilingual Matters. Stebbins, R. A. (2007). Serious leisure: A perspective for our time. Transaction Publishers: Edison, NJ. Sugiyama, M. (2010). The politics of learning foreign languages: Learning language in an imaginary reality in Japan. Osaka Furitsu Daigaku Kiyo 59, 39–50. Victori, M., & Lockhart, W. (1995). Enhancing metacognition in self-directed language learning. System, 23(2), 223–234. Wenden, A. (1991). Learner strategies for learner autonomy. New York, NY: Prentice Hall. Thank you for shining a light on eikaiwa. Given the size of the industry and the fact that many language learners in Japan will come into contact with it at one point or another, it really is staggering that it remains a neglected area of academic inquiry. Additionally, despite the lack of research into eikaiwa, I feel that you provided an accurate representation of the challenges it faces in the area of SDLL. Moreover, the online audio and video resources will help teachers engage learners in out-of-class study. Having worked in eikaiwa for the past 15 years, I certainly agree with the point you made about it being “more akin to a service industry.” I feel that many companies operating in this space are attempting to sell a language learning service that best matches their ‘clients’ perception of what language learning is, regardless of the effect it is actually having on the development of their ‘clients’ language. Unfortunately, I think it may be hard to find examples of SDLL that extends further than assigning homework from the textbook in order to prepare for the following lesson in many eikaiwa classrooms. I presume this is often the case because of a lack of awareness on behalf of students and teachers of the multiple benefits SDLL can offer. Moreover, limited teacher training in eikaiwa may make it challenging for teachers to provide informed information or advice on SDLL. The above issues aside, it could also be argued by that actively promoting SDLL in eikaiwa is counter-intuitive to the economic goals of many eikaiwa schools. In short, encouraging SDLL could result in fewer students re-signing for future courses. Do you think this an accurate reflection of the industry or am I being overly cynical? On a more positive note, I have also seen examples of eikaiwa schools, which, albeit to a limited degree, do value SDLL. In my current teaching situation, teachers discuss learner goals and views through the completion of a needs learning analysis prior to the start of the course. Moreover, students are encouraged to be vocal about the learning resources they feel they require and negotiate materials and teaching styles with the teachers. I share your belief that more research into language learning in eikaiwa is necessary and applaud your commitment to helping improve the quality of education in an area that needs it. Thank you very much for your insightful comments on my paper. You raise a number of valid concerns about the viability of SDLL in eikaiwa that I would like to try and address. I feel the primary concern over SDLL in eikaiwa is, as you said, whether it is compatible with the business interests of schools. From my eight years of experience as an eikaiwa teacher, I actually found that the more self-directed learners who would engage in voluntary out-of-class study were generally long-term students (customers). This was perhaps due to the deeper investment they had made in their language learning or because they had developed more effective self-regulation strategies. More research into this area could prove to be a powerful tool in persuading eikaiwa owners to provide more support for self-directed learning materials or support. In my case, the main reason I felt I had to foster greater self-directedness in my students was down to the questionable hiring practices observable in many eikaiwa schools. I believed that by fostering a degree of autonomy in their learning, their language learning future would not be as closely tied to one institution or teacher. As I was constantly aware of a revolving door of largely untrained or disinterested teachers in many eikaiwa schools, the bleakness of my students’ situation stuck in my mind. I believed that I had a responsibility to foster in my students a sense of independence that would help them stand a better chance of developing despite, rather than because of, the school. I agree that the promotion of SDLL in eikaiwa schools is a daunting prospect with a variety of institutional and ideological barriers standing in the way of teachers and administrators. However, despite a great many hurdles (and with a little subversion), I was able in a few cases to help students to engage in learning away from the confines of the classroom. In some cases, these students are still using language learning programs that I introduced them to or writing reflective diary entries that they show me every time we meet up. I take a page out of John Fanselow’s book when I say that I believe a small change can make a big difference, even in eikaiwa. Thanks for your support and keep fighting the good fight! 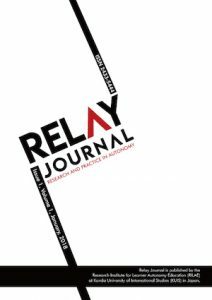 Relay Journal is published by the Research Institute for Learner Autonomy Education (RILAE) at Kanda University of International Studies (KUIS) in Japan. It is a completely free, open-access journal dedicated to disseminating research and best practice in the broad areas of learner and teacher autonomy.